If you want to attract a buyer, start by catching their eye. Before a buyer ever makes it to your front door, the first introduction they’ll have to your home will probably be the picture you’ve included with your advertising- on your internet listing or on a brochure. It pays — literally — to know how to photograph your home in its best light. You spend hundreds of dollars to get quality portraits of your family — don’t scrimp when it comes to selling your home. You’ve invested money and time by choosing to sell your home yourself- now make sure you don’t sell yourself short! Take a great picture and let your home speak for itself. Before you take any pictures, make sure that your home is picture perfect. A little effort goes a long way, and this is the time to channel your inner Ansel Adams. Stand in front of your home and take a visual assessment. How do the shades in the bedroom window look? Does it look nicer with the curtains in the living room drawn or open? 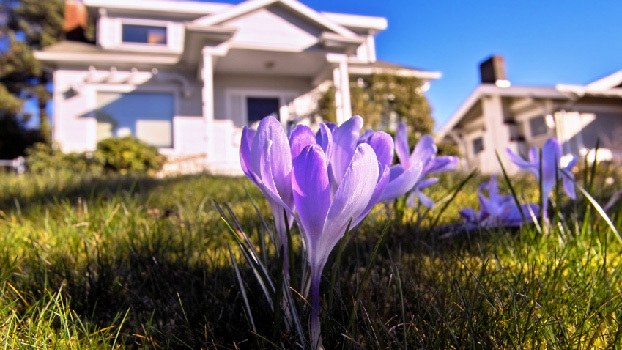 If your flowers aren’t in bloom, it might be a good idea to move that planter off the porch and out of view. Mow the lawn, and trim any shrubs or trees. Remove any toys, sports equipment, or accessories from the yard- you might think your lawn gnome is adorable, but it could turn off a potential buyer. Put the garbage can into the garage, and close the door. And park your car on the curb, out of view. Wait for a sunny day before you pull out the camera. The best time of day to photograph your home will depend upon which direction it faces. You’ll want the sun behind you, shining on the front of your home. WEST: Take photos in the evening, within two hours of sunset. EAST: Take photos in the morning, within two hours of sunrise. NORTH: Watch for the time of day when the sun shines on your house. If your house doesn’t get any direct sunlight, try to snap the photo on a bright day when the sun moves behind a cloud. If you decide to include interior photos of your home, you’ll want to follow the basic ideas that apply to taking photos outside. You don’t necessarily need to include photos of every room in your house. Choose the rooms that are special or unique- perhaps your kitchen has a terrific breakfast nook- and the “important” rooms- everyone wants to see the master bedroom and the family room. Make sure that every room you choose to photograph is clean, tidy, and well lit. Take photos from several angles and select the one that best represents the features or showcases the dimensions of the room. Remember, you’re selling your house, not your possessions. Think of your furnishings as props, and photograph the prominent features of your house. It’s more important to capture the big bay windows in the family room than it is your favorite leather sofa. You don’t need to have a professional camera to take a good picture, but quality is important. You’ll want a camera that takes sharp, clear photos to show your home in its best light. A digital camera is a great choice, since you’ll be able to see the photos immediately after you’ve taken them. Set it on the highest possible resolution. After you’ve selected the best photos, upload them to your internet listing. If you’re using a 35mm camera, take as many photos of your home as possible, and have them developed. Choose the best shots and mail them to our offices, Or to save time bring the photos to your local office supplies/services store (Stapes, Office Max, Office Depot or Kinko’s) They can scan your photos and convert them to digital files for a minimal charge and then you can upload the photos immediately. The whole purpose of including photos is to catch a buyer’s eye, but you definitely don’t want to get noticed for the wrong reasons. Under no circumstances should you use a Polaroid or a camera phone snapshot. Similarly, don’t use photos printed off a non-photo color printer or captured from a video camera. A picture is worth a thousand words – and in this case, it may be worth thousands of dollars. Just look at the difference a good picture can make. Many people who are looking for a new home will decide upon the neighborhood in which they’d like to live and then drive around that neighborhood looking for available properties. For this reason, a good sign could make a big difference. While your sign will probably garner less interest than more informative means of advertising like web listings or a fact sheet. In fact, according to a national average, between 10 and 20% of your calls could be based on your sign, depending upon the location of your home. Obviously, a house on a busy street will attract more drive-by attention than a house on a cul-de-sac. But even so, a yard sign is a potential source of word-of-mouth from your neighbors and passersby. A cheap looking sign will detract from the otherwise attractive appearance of your home. Even worse, a bad sign could turn off potential buyers by causing them to wonder what else you have tried to cut corners on. In addition to a yard sign, you should consider purchasing a brochure box. The ForSaleByOwner.com Brochure box is made of sturdy clear see through plastic that holds up to 100 sheets of paper and will keep your brochures dry despite the weather. This eye-catching box is a great way to follow up on your quality sign by ensuring that information will always be easily accessible to interested buyers. Like a professional sign, it will result in more qualified callers, since passersby will be able access all the information they need before they ever pick up the phone to talk to you.